If you have manual capture enabled, you need to capture all credit payments in your online shop by hand. Normally you will do this after you have shipped an order. Important: You need to manually capture a payment within 14 days. After this the order will automatically expire and your customer needs to place a new order from scratch. In your Online Shop dashboard, click Orders. Click the order that you want to capture the payment for. Click Capture Payment, below the order details. Check the amount that is to be captured; you can adjust it if needed, for example, if you are unable to deliver all items. Click Accept [the amount] to process the payment. 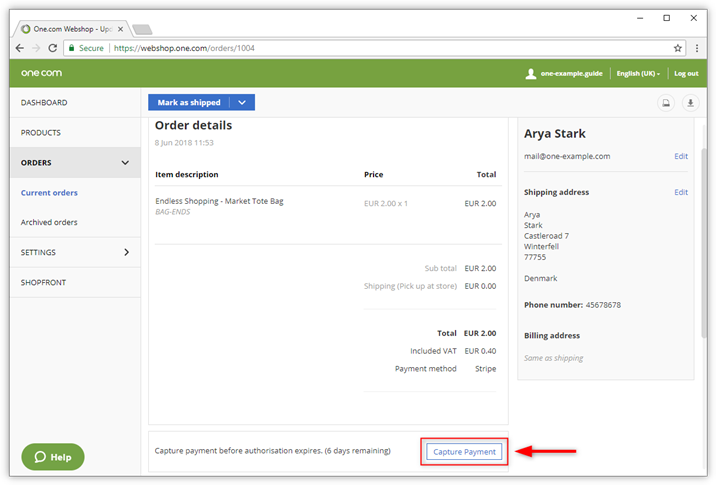 Tip: You can also capture the payment, when you mark an order as shipped. Just make sure that the box for Capture Payment is checked.